Alex Durelli drives his first shot in the first hole of a sudden death playoff at the Catholic League championship Oct. 4 as his opponent, Andrew Gallagher, looks on. 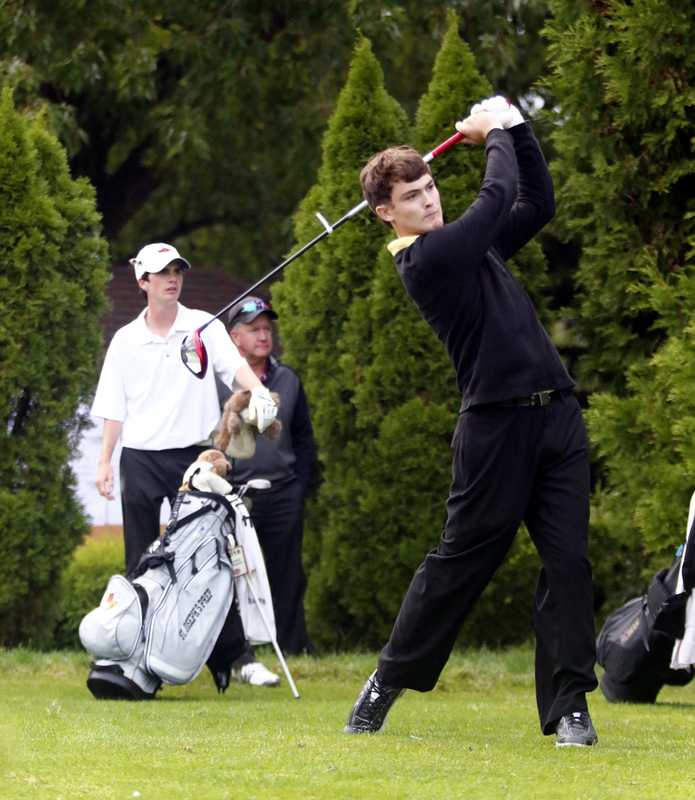 La Salle High School has participated in 19 golf tournaments this season. According to one of its top players, the marquee event just finished. “Mr. 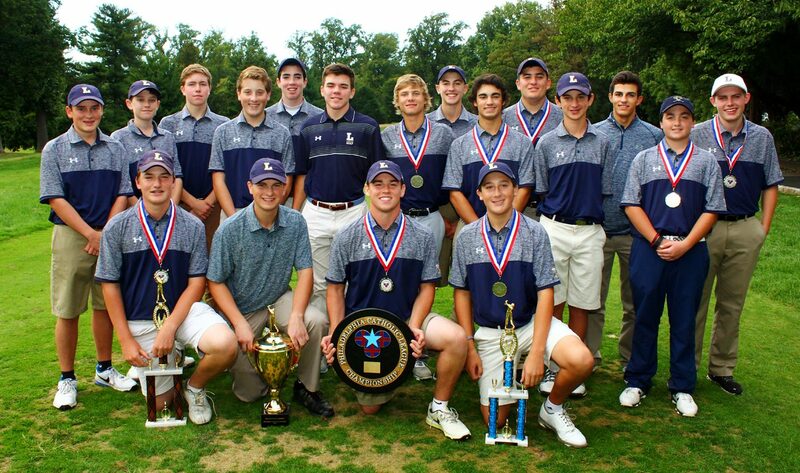 (Marty) Jackson (golf coach) has been telling us since the beginning of the season that winning the PCL (Philadelphia Catholic League) is our first goal,” said junior Bud Hansen. On Oct. 4 at Melrose Country Club, the Explorers improved their overall record to 16-3 with a 10-stroke victory over second-place St. Joseph’s Prep. Aided by its 272-282 victory, La Salle has dominated Catholic League golf throughout the 21st century, with 14 titles since the year 2000. Hansen and sophomore Frank Gregor both posted scores of 76, with teammate T.J. Chaykosky close behind at 77. Also earning All-Catholic honors for the Explorers were Tim Lorenzo (80), Steve Lorenzo (81), Brent Schoeller (82), Matt Acker (82), James Kelly (82) and Ryan O’Neill (83). Individually, Roman Catholic senior Alex Durelli captured first place in dramatic fashion. He and St. Joseph’s Prep junior Andrew Gallagher were tied at 73 after 18 holes. Durelli outlasted his competitor in the first round of a sudden-death playoff. Durelli said the most challenging aspect of prevailing in overtime was remaining calm. Karly Brown finished third overall with a 75. The Archbishop Wood senior, however, also competed for the girls’ individual title, winning the event for a fourth consecutive season. “Winning was a great way to finish my high school experience, and I am really fortunate to have had a great four years with the team,” said Brown. “Placing well within the boys’ championship kind of turned everything around for me. In addition to those already mentioned, the following players were named All-Catholic because of their tournament performance: Archbishop Wood’s Joe Mallozzi (78); Archbishop Ryan’s Corey Hunter (79); St. Joseph’s Prep’s Will Keane (79); Bonner-Prendergast’s Joe Dougherty (80); St. Joseph’s Prep’s Jack Mitchell (80); Bonner-Prendergast’s Pat Lord (81); Lansdale Catholic’s Marcus Janinek (81); the Prep’s Mike Leonard (81); Roman Catholic’s Dom Hagy (83), and Bonner-Prendergast’s Corey McGrenera. Next up for several teams and individuals is the District XII tournament, scheduled for Oct. 11 at Blue Bell’s Meadowlands Country Club. John Knebels can be reached at jknebels@gmail.com or by Twitter @johnknebels. The Little Flower team, coached by Michael J. 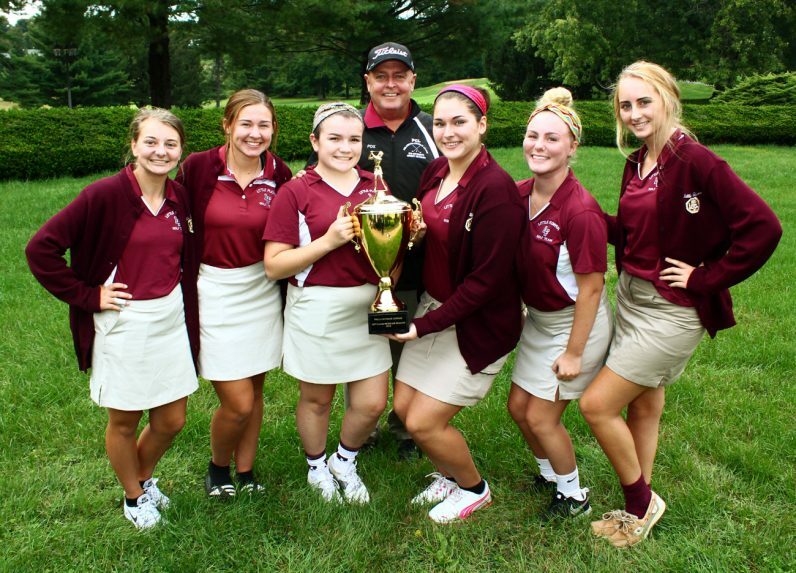 Fox, took home the girls’ Catholic League golf championship trophy.